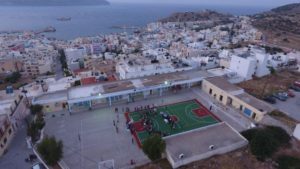 The Hellenic Initiative Australia has funded two multipurpose sports facilities at schools on the remote Aegean island of Karpathos through a special grant to Axion Hellas. The Hellenic Initiative Australia partnered with Axion Hellas to secure the construction of two new sports facilities at primary schools in Pigadia, the capital of Karpathos, which is part of the Dodecanese group of islands. 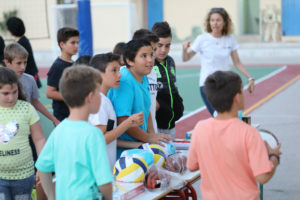 The children were playing training on substandard surfaces such as concrete and dirt and a request was made to Axion Hellas by the local municipality to improve the sports facilities available to children on the island (population 6500). Launched in April, the multipurpose sports grounds, with an acrylic surface, can be used for basketball, football, volleyball and other sports. The students of both schools (total of 278 students) and all the children on the island will benefit from the use of the sports grounds. “We are delighted to support the community in Karpathos and assist Axion Hellas in its mission to provide infrastructure to remote communities,” said The Hellenic Initiative Australia President Nicholas Pappas. The AU$32,000 grant from THI Australia covered the construction costs of the new facilities. “The Karpathos project is a wonderful example of collaboration for the benefit of remote areas in Greece, promoting a spirit of unity, solidarity and progress, to the local communities, said Axion Hellas President, Vassilis Pateras. Welcoming the grant, Karpathos Mayor Ilias Lambros said the local municipality would undertake the ongoing maintenance of the facilities. 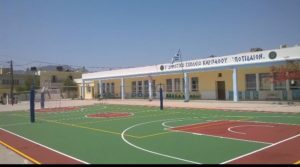 “The Municipality of Karpathos has accepted with great joy, thanks and gratitude the donation from The Hellenic Initiative Australia, which made possible the construction of two new facilities at primary schools in Pigadia that will be available to the children of Karpathos for many years to come,” said Mr Lambros. Axion Hellas’ mission is to support society and particularly vulnerable groups in remote and underprivileged communities of the country to improve their quality of life. Due to the adverse economic conditions and the distance from the big urban centres, these islands and rural villages are deprived of easy access to basic needs such as health and education infrastructure. Medical Services– Teams of well-established doctors and volunteer nurses provide preventive and specialised medical care for patients living in remote areas of Greece during three annual missions to the Ionian, the Southeastern Aegean and Northeastern Aegean. Infrastructure Projects – Projects that improve existing infrastructure for local society, including medical facilities, cultural centres, sports facilities, school playgrounds, school supplies, etc. Cultural Projects – Educating and training local communities in new technologies and communication methods to enhance the development of their local natural heritage and stimulate local economy.